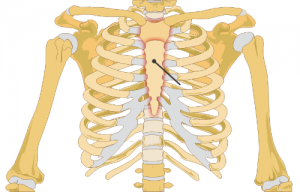 Sternum or sternal fractures can occur whenever a person experiences blunt force pressure or trauma to the chest. 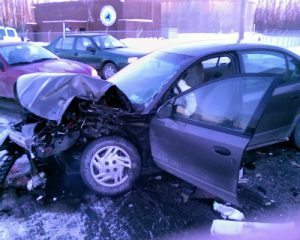 In a car accident, you can sustain such an injury if your chest impacts the steering wheel or panel or, for a passenger, the dashboard or seat in front of you. Elderly persons or those with fragile bodies are more susceptible since less force could result in a fractured sternum injury just by a sudden flexing of the chest. Otherwise, it generally takes an impact of considerable force to cause such injuries in healthy individuals. Call the personal injury lawyers at Burns & Jain if you or a loved one sustained such a fractured sternum injury. It is vital that a doctor or hospital immediately conduct tests, which may include a CAT scan, MRI or other diagnostic tests to see if internal injuries exist. The mortality rate for persons who suffer internal injuries from sternum fractures is from 25 to 45% so prompt attention to this kind of injury could be life-saving. Sternum fractures can take months to heal. Your movements need to be restricted and you may find it difficult to sleep without a sleep aid. Often, a regimen of physical therapy is prescribed to strengthen the chest muscles. In severe cases or where the bone is unstable, surgery may be required. If internal injuries occur, then the rehabilitation and healing time can be longer. If your injury was caused by the negligent conduct of another motorist or party, then you are entitled to compensation for your injuries. Your chest injury lawyer can be instrumental in demonstrating to an insurance adjuster, insurance defense lawyer or a jury how this injury has substantially affected your enjoyment of life and ability to perform the activities we take for granted. Contact the experience lawyers at Burns & Jain for your chest injury case. They have handled serious injury cases since 1985 and obtained millions of dollars in compensation for injured clients. As always, the initial consultation is free.